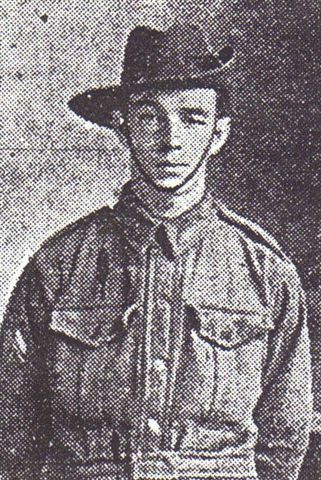 Frank Aitken (Service No 1869) was born in Sydney in 1896. He attended Unanderra Public School near Wollongong, N.S.W. Frank had spent 18 months with 21st Infantry Militia before he enlisted at the age of 20. At this time Frank was single, worked as a clerk, and lived at Unanderra, N.S.W. He embarked from Sydney as a Signaller with 4th Reinforcements, 3rd Battalion, on HMAT A9 Shropshire on 17th March 1915. After arriving in Egypt he was sent to Gallipoli and landed there on 31st May 1915. While engaged in the battle for Lone Pine Frank was wounded in action. He was evacuated to the hospital ship Dunluce Castle for treatment but died from his wounds while on board. Frank was buried at sea the same day. He is commemorated on the Lone Pine Memorial and on the Unanderra Public School Honour Roll. Frank Keith Aitkin - spelt Aitkins on Embarkation Roll documents.